Your success as a rental home investor heavily relies on finding and keeping responsible tenants. To be profitable, you need quality tenants that will pay rent on time and in full each month, plus respect and care for your property. Certain characteristics of a rental home attract or detract different types of tenants. If you are looking to purchase an investment property, the professionals at Real Property Management SAC-METRO offer a few guidelines to help you find a home that will bring a good return. Tenants are just like any other consumer – a customer shopping around for a product that will fit their needs for a great price. As a leading Sacramento property management company with more than 30 years of experience, we know what tenants want in a rental home. When searching for the ideal investment, there are a variety of factors to think about. Some rental properties are easier to lease than others. The location of a home carries a direct impact on your financial success as a landlord. Even a well-maintained home will be difficult to rent out if not in a great location. But what makes a great location? Proximity to schools – Being close to schools makes a big difference in real estate, especially in a good school district. A school district with a high rating is particularly helpful. Distance to local shopping – Tenants care about where the nearest grocery store and shopping outlet is located. Being near a nice commercial district is very beneficial. Accessibility to public transportation – This is all about having easy access to the bus, train, and other mass transit. Beyond that, being by a freeway is important to those who commute by car. While these are positive features in a home, they can also have a negative effect as well. A home that is too close to a freeway is undesirable, such as a house where the backyard faces a highway. Or beware of a home directly in the high traffic zone of a school. The twice-a-day traffic created by buses and parents dropping off or picking up children can be a deterrent for tenants. Tenants want to feel safe. Find a home where there is little to no crime. Check the crime statistics. Browsing through the neighborhood can help you get a feel for the area. Are people out and about enjoying walks and playing with their children outside? Can you spot neighbors conversing one with another? Do you see litter, graffiti, or abandoned buildings nearby? Are there large apartment complexes in the area? Does the neighborhood have a high ownership rate or are there a fair number of “for rent” signs? There are pros and cons to buying a home in a neighborhood with a Home Owners Association. From Carmichael to Rocklin, property management companies may offer to explain how HOA regulations will impact you. Real Property Management SAC-METRO is a Sacramento property management company that goes above and beyond that. Our experts have the knowledge and expertise to help you follow the rules that specifically apply to landlords. We do not want to see you hit with violation fines or hidden fees. On the other hand, there are financial benefits to renting out a home within an HOA community. You can set a higher rent rate if the neighborhood offers certain facilities. Tenants will pay extra to have access to a pool, clubhouse, and community gym. During a walk-through, prospective tenants need to be able to envision living in the home. Some houses make that difficult if they have an unusual floor plan. Avoid quirky layouts – Stick to standard floor plans. Better yet, find a home with an open floor plan that flows well. Also, an overly customized home is not very user-friendly. Stay away from a home with less than 1,000 square feet – Too small of a home will work against you. Look for a home with 3 or more bedrooms and 2 or more bathrooms. Also, watch out for homes that lack a clear master bedroom or have no master bathroom. Look at overall storage space – How many closets are in the home? Is there a pantry? What about a laundry room? If you find a home that does not match these standards, consider renovations. Remodeling a home is a good option if you are careful to find cost-friendly ways to improve the home. Amenities make you profitable. The more a home offers, the more you can charge in rent. Does the home have a fireplace? Is there an A/C unit or a swamp cooler? Are there ceiling fans in the bedrooms? Laundry hook-ups available? What about a specific spot for a microwave? Before buying a home, think of what features will bring you the best return. In addition to these characteristics, you must evaluate the overall condition of a home. Homes more than 15 years old tend to require more maintenance repairs and necessary upgrades. Why Partner with a Sacramento Property Management Company When Buying an Investment Property? From Folsom to Rocklin, property management companies all across the greater Sacramento area offer various services. The experts at Real Property Management SAC-METRO are committed to helping you buy the perfect investment property. We understand the rental market and have the resources to help you locate a home that will bring a good return. But our assistance doesn’t stop there. We offer a comprehensive list of services to help you be a successful homeowner once tenants move in. Our hassle-free leasing cycle is designed to increase your cash flow and minimize common landlord mistakes. We take over those tedious everyday duties of managing a rental property. Leave the midnight emergency maintenance calls to us. 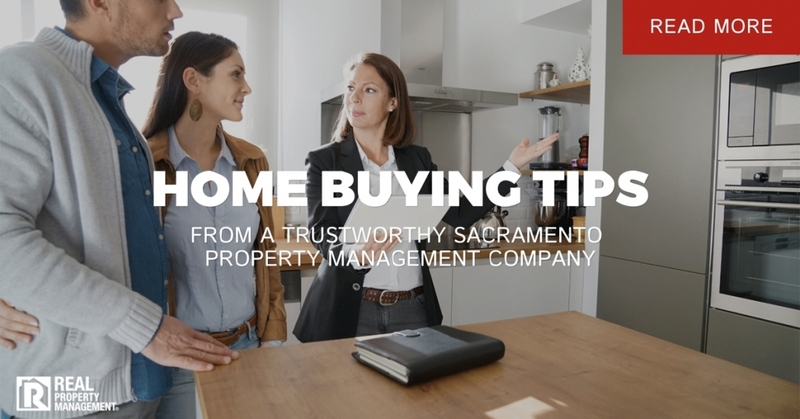 Don’t trust just any Sacramento property management company. Give Real Property Management SAC-METRO a call today and learn more about our proven processes. Put our experienced team to work for you. Tenant Screening with Sacramento Rental Property Management Searching for Dependable Residential Property Management in Sacramento?